Peter Arkell reviews Defy the Stars, The Life and Tragic Death of Tom Hurndall, which tells the struggle to uncover the truth behind his killing by an Israeli sniper. In the spring of 2003. 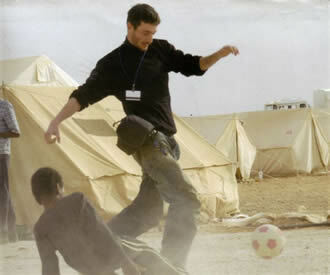 Tom Hurndall was in Jordan helping to put up tents in a Palestinian refugee camp, a typically selfless activity by the 21-year-old photo-journalism student. Not long after he was drawn to Rafeh in the Gaza Strip near the Egyptian border after hearing of the killing there of Rachel Corrie, an American girl. An Israeli Army bulldozer had run over and crushed her while she was peacefully protesting at the demolition of Palestinian homes. He took his camera and notebook to make a record, met up with members of the International Solidarity Movement (ISM) in Rafeh and joined their campaign to highlight the destruction of homes, the shooting of civilians and the abuses of human rights on the part of the Israeli Defence Force (IDF). ISM’s policy was not to hold a protest when there was shooting in the vicinity and a planned demonstration had been cancelled for this reason. Tom and a few others, all of them wearing fluorescent orange jackets, stood observing a group of about 20 children playing on a mound of rubble at the end of a street. They could see and hear bullets ricocheting off a building beside the mound, but the children were evidently accustomed to this danger. Gradually the shots, from an Israeli watchtower, were aimed lower and lower, scuffing up the sand round the children’s feet. Most of the kids ran off at this point, but a boy and two little girls, all about six years old, stood rooted to the spot, terrified and crying for help. Tom handed his camera to one of the group and went over to the mound, lifted the boy up and carried him to safety out of range of the bullets. He went back for the two girls, bent down and put his arms round one of them to lift her up and was shot through the head by an Israeli sniper. He died nine months later, having never recovered consciousness. 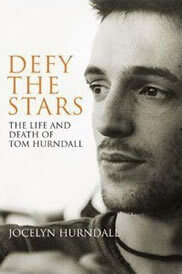 Defy the Stars, The Life and Tragic Death of Tom Hurndall, is the story of Tom’s life, including the nine months he spent in a coma, and the fight for justice after the shooting, written by his mother Jocelyn. It tells of the shattering effect of the murder on his family and the persistent, and courageous struggle for the truth and for justice that the family pursued over the next couple of years. They had to face not only a cover-up by the Israeli authorities but indifference from Tony Blair in Downing Street. It was this tenacious quest for all the details, for the simple truth of what had happened and how and why, involving many difficult, painful trips to Gaza and to Israel that brought her and the family into collision with the Israeli authorities and their agenda, and that, at the same time, opened up for them a new and very shocking understanding of the real forces at work. The lies, denials and dis-information coming from the Israelis were eventually to back fire in spectacular fashion. The book is particularly powerful for being the account of somebody who would not normally have come into contact with this reality, and who had previously led a relatively comfortable life as a teacher away from it all, and had even, as a student, worked for a time on a Kibbutz. We follow Jocelyn’s feelings of incredulity when she firsts visits Rafeh soon after the shooting, at the cruelty and savagery of the occupying army towards the ordinary Palestinians there, feelings that change into anger and then into support, sympathy and even love of the many Palestinians that she meets, and of their struggle. Thanks entirely to the heroic efforts of the Hurndall family, their supporters and the international interest that they attracted in the media, the Israeli army eventually agreed to a meeting with the family, and later to a trial of the soldier who had shot Tom, a Bedouin as it turned out, who was sentenced to eight years in prison for manslaughter, obstruction of justice and false testimony, an unprecedented outcome. The family had always seen the issue as a killing by a soldier, and it could have been any soldier in the IDF, “who is quite certain he’s going to get away with it”. Jocelyn’s union, the National Union of Teachers, along with Education Action International, has established a fund in memory of Tom with the aim of helping vulnerable disabled children in Gaza. Email info@education-action.org for information. Defy the Stars, The Life and Tragic Death of Tom Hurndall by Jocelyn Hurndall. Bloomsbury. £16.99 hardback.